Our Dive Centre Looks out to the Ocean! 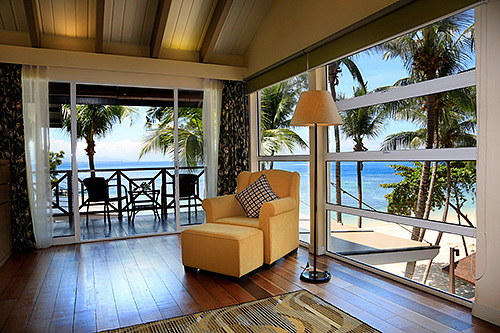 With Direct Access to the Sea! Enjoy Down Time with Others! 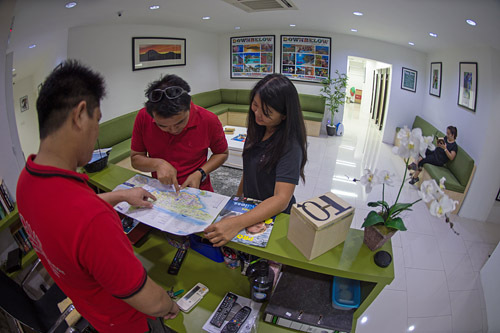 It’s true location is “almost” everything and we proudly offer our clients the choice of TWO Downbelow PADI 5 STAR Career Development Centres based within the Tunku Abdul Rahman Park so you can decide which PADI dive centre Kota Kinabalu, Sabah suits you. Both are purpose built dive facilities on paradise islands. Our PADI 5 Star CDC Centre on Gaya Island caters for day trippers who prefer to stay overnight on the Kota Kinabalu mainland in KK City or other resorts. Our PADI 5 Star CDC Centre on Manukan Island caters for guests that wish to stay overnight in the Tunku Abdul Rahman Park. 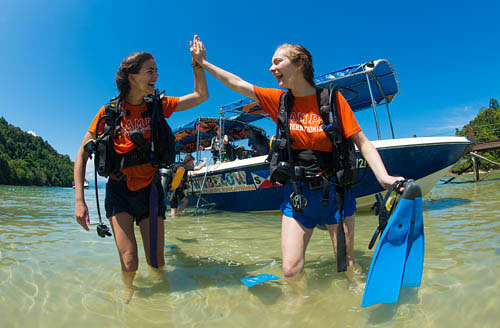 Both dive centre have access to all the same dives sites in the marine park and offer the same PADI Courses, daily diving, snorkeling so your diving experience will be the same from either location. The difference is the time you spend out of the water and this is what will dictate which PADI dive centre Kota Kinabalu, Sabah suits you. 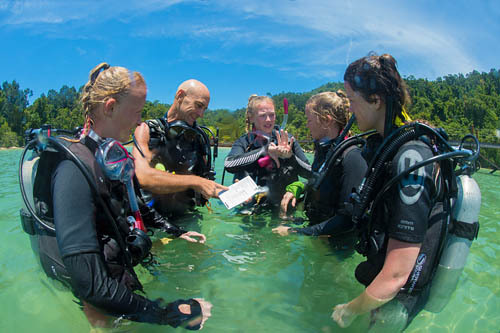 Candidates that join for our internationally renowned PADI Divemaster & PADI Instructor Development Courses benefit from the education they receive at both PADI dive centres. Our PADI 5 Star Career Development Centre fondly known as “The Beach House” on Gaya Island is perfect for those people looking for an all inclusive package. We include KK city land transfers, lunch, refreshments, required euipment plus your chosen fully guided activity or PADI course. The island provides a very special experience, it is a fun place to spend the day where our guests can enjoy our tropical paradise. We are the only operator at this location so our surroundings are non crowded. Surface intervals between activities are taken on the beach house veranda so even if your family or group are taking part in different activities you will still be together during the breaks. Basic washrooms and fresh water non-heated showers are available. We serve a freshly cooked local lunch of rice, a meat dish, vegetables and fruit, vegetarian & vegan options are available. At 15km², Pulau Gaya, or Gaya Island in English, is the largest of the 5 islands and home to a local stilt village on the eastern shore nearest to the city. It remains un-spoiled and is not on the main tourist route. 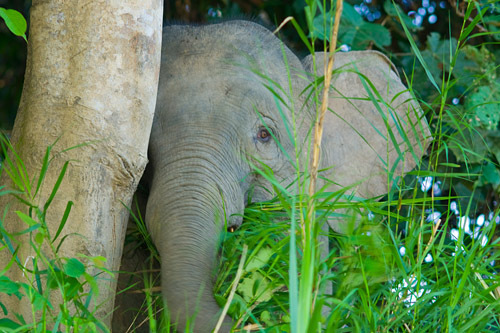 Walking trails criss-cross the island, meandering through virgin, tropical rain forests. 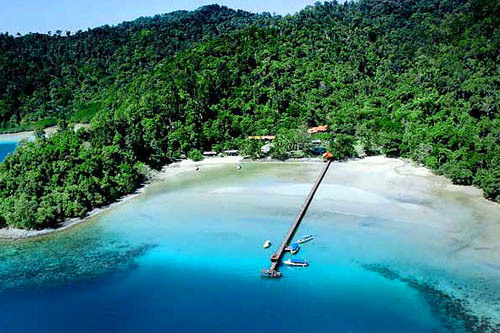 Gaya Island is surrounded by ocean, abundant with diverse and fascinating marine life & wildlife. We have sheltered reefs with year round dive access. Pool vs Confined Open Water ? 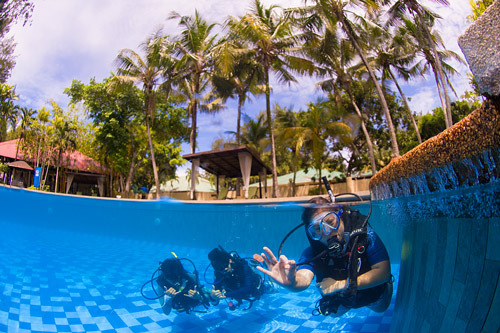 Confined water training for skill practice and introduction to scuba diving takes place immediately in front of the dive centre, which boasts a natural confined open water lagoon. Open water dive sites start literally a giant stride away from our jetty, with the rest a few minutes away by boat. 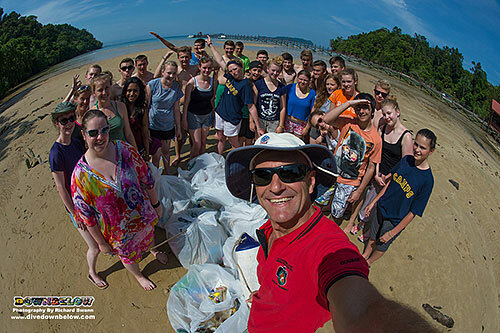 Our PADI 5 Star Career Development Centre on Manukan Island is perfect for those people wanting a beach resort holiday. 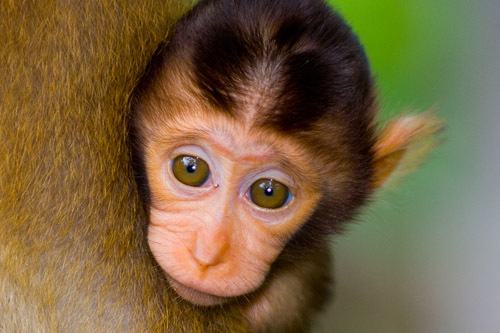 We offer great value stay & scuba dive and stay & snorkel safari packages. 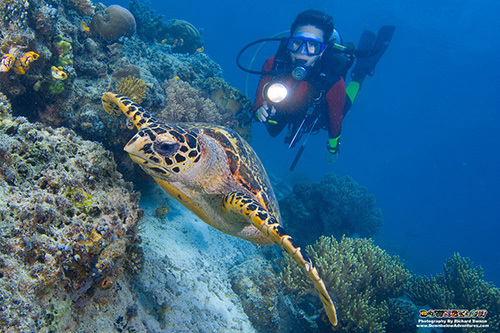 We also offer daily scuba diving, PADI courses, snorkel safaris and sea kayaking trips to walk-in guests so if you are staying at the resort you can find us at the pool side and subject to availability book your activity. If you are island-hoping and want to fit in a couple of dives, drop by and say “hi”. Pre-booking is advised particularly during peak season since we limit all our activities to small groups. If you want to pre-book your day trip to our PADI 5 Star IDC Dive Centre on Manukan Island please contact us. Whether you are an in-house guest or with us for a day trip, between activities you can enjoy the resort facilities. Relax next to the resort pool, treat yourself to a slow mango lassi or cappuccino between your activity. At lunch time the resort offers an A La’ Carte menu or beach BBQ (a personal favourite). At the end of the day do “as divers do” and enjoy sundowners at the beach-side bar. All food & beverage is at your own expense. Resort washrooms are provided. 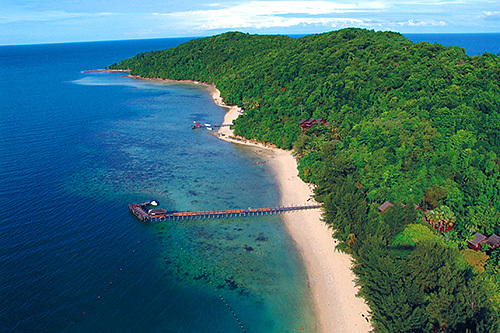 Island transfers are not included in our standard package, however your daily boat transfers can be arranged with us or you can use the water taxi’s that operate daily within the Tunku Abdul Rahman Park. At Manukan island training for scuba diving skill practice and introduction to scuba diving takes place in the resort swimming pool. 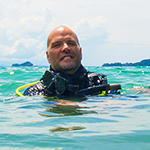 Open water dive sites are accessed from the beach with the rest of the 49 dive sites in the marine park just a few minutes away by speedboat. 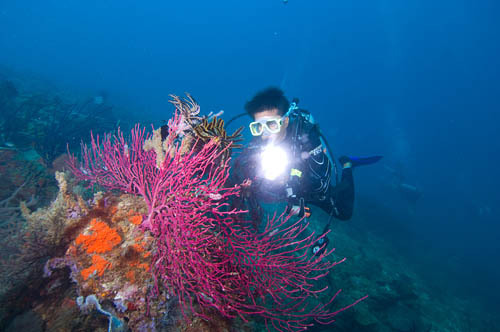 Both PADI dive centre Kota Kinabalu, Sabah are purpose built and offer the same high standard of safety & equipment you would expect from a Downbelow PADI 5 Star CDC dive centre. Fast custom- built speedboats, air compressors with NITROX, a certified equipment service center plus equipment to easily handle a great variety of shapes and sizes. 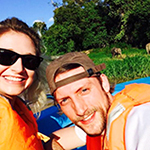 Downbelow’s international staff are highly skilled with many years of experience in their field and we pride ourselves on an exceptional level of service and safety. 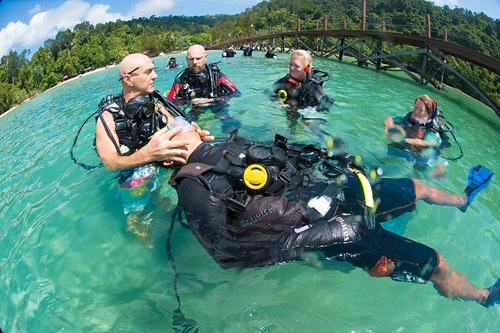 Our diver-to-dive-guide ratios are very low, ensuring that new divers a well looked after and experienced divers can enjoy the dive to the full. 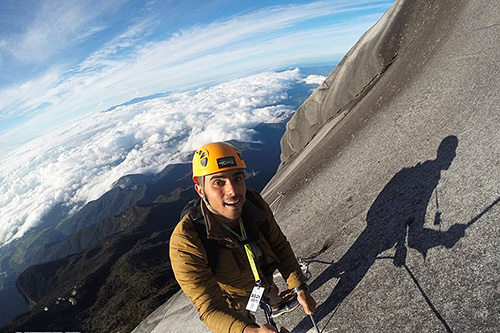 Where Do You Want Your Borneo Adventure to Take You ?